Bald Eagle Photos from TheRagens.com, July 2004. Photograph Notes: This photo was the culmination of over a year of waiting and finding the right opportunity. 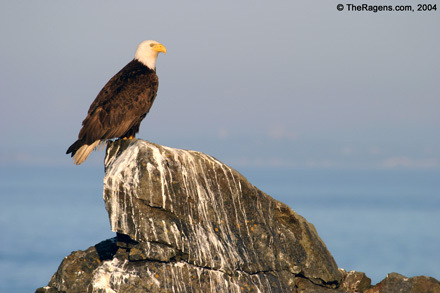 This particular perch is frequently used by the eagles in our area, as can be seen by the stains on the rock and I felt that this would be a strong composition. This rock is only about 60-70 feet away from our neighbor's house on San Juan Island. I used the house as a 'blind' as I could crack open a window and be close enough to get really good details. As the eagles are sensitive to movement, I arrived at the house at 4am (well before dawn) so the eagles would not see me, opened a window just a crack, set up the camera and tripod, and waited. About an hour after sunrise, while the light was still fairly soft, this eagle landed on the rock to survey the area underneath for food. I had enough time to get ten or so photographs before the eagle left.